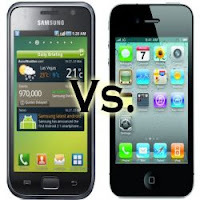 the battles of samsung vs apple will be continue ~ " World Information "
CALIFORNIA - The battle between Apple and Samsung likely to continue, as both vendors are increasing the number of complaints in their demands on issues contek-cheating gadget products they produce. As quoted from Ubergizmo on Saturday (18/06/2011), if we remember back in April, Apple is wearing boxing gloves, go into the ring and compete against one of the producers from the State ginseng. Because when it accused Samsung cheating Apple products. Legal battle was rolling in some time. In May, a federal court to ask Samsung to show to the Apple device is that their new release, to check whether it is true that Samsung has copied Apple's product line with the previous accusations. However, it seems Apple did not accept it because it does not correspond to the initial demands. It was reported that Apple recently filed amendments to his complaint. It further includes the allegation that the device used Samsung has been copied from the iPhone and iPad. Complaints initially issued the Apple is as much as 38 pages, but has now turned into 63 pages. This is because Apple is also accused several other Samsung devices come copied like Droid Charge, Exhibit 4G, Glaxy Ace, PREVAIL Galaxy, Galaxy S (i9000), Gravity, infusion 4G, Nexus S4G, Replenish, Sidekick, 10.1 and Galaxy Galaxy Tab S II. Both like confusion, but it seems Apple is really going to make the Samsung slumped. The two companies actually been told by the judge to conduct negotiations in this case. There is a report stating that the two leaders of those companies will meet to seek a way out.